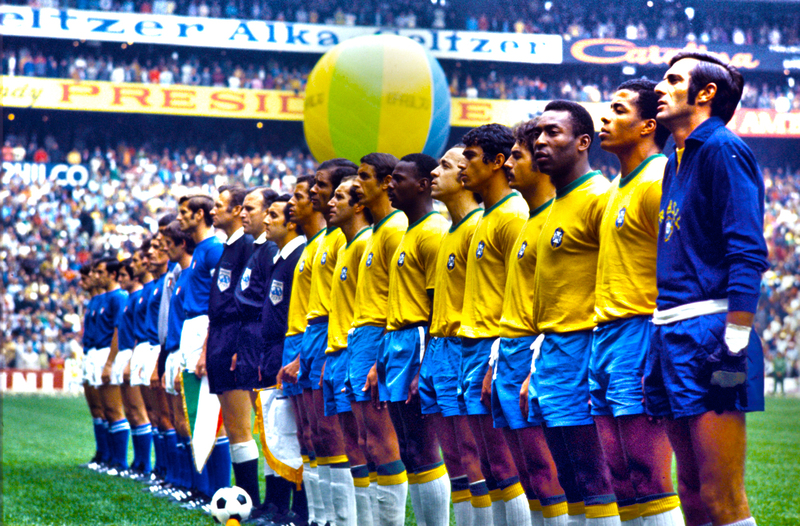 On 21 June 1970, the side who are often cited as the greatest team to ever grace a World Cup, Mario Zagallo's Brazil, defeated Italy 4-1 in Mexico City. 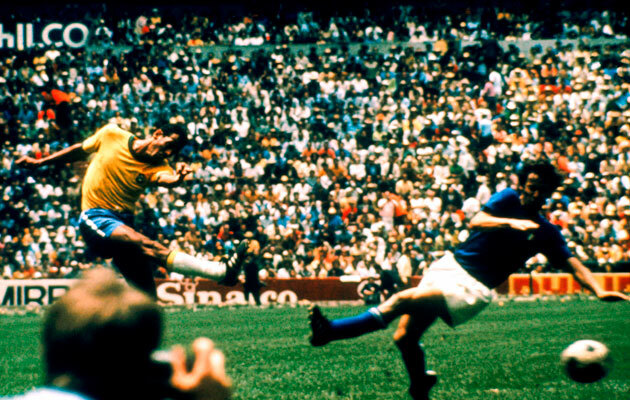 The flowing football played by the Brazilians in the final, was encapsulated by Carlos Alberto's wondrous team goal that rounded off the scoring. With Tostão picking up the ball in his own half with five minutes to play, he casually rolled the ball back to Brito who then moved it on to Clodoaldo who rather brilliantly dribbled past four Italian players. Pele, Gérson and Clodoaldo then played played the ball around in an intricate triangle, toying with their opponents in an embarrassingly easy manner. Clodoaldo then sent the ball wide left to Rivelino who found Jairzinho streaking down the line. Brazil's leading scorer then clipped the ball to Pele who rolled a perfect pass out to Carlos Alberto, who lashed the ball home. In the forty-six years since this final, it's hard to recall a better team goal. This was Joga Bonito at it's finest. It was also a crowning achievement for Pele after he had vowed to never play in the World Cup again after being kicked off the pitch by Bulgarian and Portuguese defenders in 1966 and missing most of Brazil's 1962 campaign with injury. 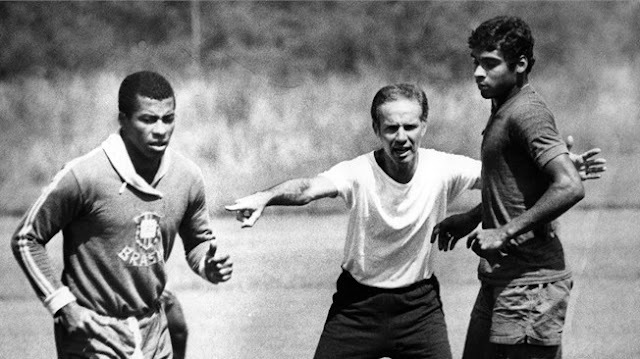 Going back on that decision in 1969, he became the centerpiece for a rebuilt Brazilian side that featured legends such as Rivelino, Jairzinho, Gérson, Carlos Alberto Torres, Tostão and Clodoaldo. It has been forgotten in the dusty pages of history though that it was not a dead certainty that they would lift the Jules Rimet Trophy for a third time that summer. Brazil had changed managers before the finals, and many observers felt that there were simply too many artists and not enough workers in their squad. Zagallo, who had won the World Cup twice as a player (1958 and 1962), would go some way in proving any of the doubters wrong. Paired with England, Romania and Czechoslovakia in the opening group stage, they kicked off their campaign with a thumping 4-1 win over the Czechs. In perhaps their toughest match of the finals, they saw off the reigning champions from England 1-0 in their second opening group match to effectively secure their place in the Quarter-Finals. They would edge past Romania 3-2 to take the top spot in the group. In the first knockout round, they would coast past Peru 4-2, with Tostão scoring a couple of terrific goals. A 3-1 victory over Uruguay in the Semi-Finals saw Brazil through to the final, where they would brush aside a talented Italian squad. In summarizing the Seleção's triumph, sports writer Jeff Powell commented: "Brazil '70 were a team of superstars dedicated not just to a cause but an ideal, a dream of what football should be." A fitting tribute to a wonderful side.